Performance art, as a practice, may have found its fullest realization in the work of Saturday Night Live (SNL)’s Tina Fey. Fey’s channeling of Sarah Palin’s character is uncanny. In her re-staging of Katie Couric’s Palin interview and Palin’s performance at the Vice Presidential “debate,” Fey has merged the absurd-in-the-real to the really absurd, producing a composite memory of Sarah Palin that defies separation. 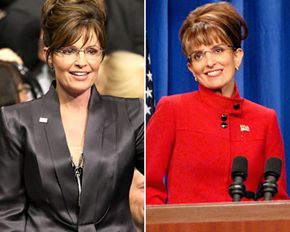 When Sarah Palin appears on my television screen I see Tina Fey’s performance of Sarah Palin, rather than Sarah Palin’s performance of Sarah Palin. Fey has altered my perception. She—along with Amy Poehler as Hillary Clinton and Darrell Hammond as John McCain—has seamlessly infiltrated the mainstream political flabber-jabber. Saturday Night Live, along with a handful of other comedy shows, has become the best political commentary and performance art ever. Part of its influence comes from the cheerful participation of real politicians in the parodying of their own personas. On any Saturday night you might see Barack Obama playing “Barack Obama,” John McCain playing “John McCain” or Hilary Clinton playing “Hilary Clinton.” Then there’s SNL’s Amy Poehler as Hillary Clinton, talking to the (supposedly) actual Hillary Clinton. America knows all politics is performance and that the best performance of politics is on the tube. There’s Stephen Colbert’s “truthiness,” Jon Stewart’s “Indecision 2008” and David Letterman’s all-night reaming of John McCain. And how about Chris Rock’s comment to David Letterman after guest Bill Clinton left the stage? “Is it me, or did he not want to say the words ‘Barack Obama?’” Clinton nearly had an aneurism rather than mention the Democratic nominee by name. Wow! That’s better performance art than Annie Sprinkle handing us a speculum! We may be witnessing the most politically influential performance art ever made. Wonderful commentary. Keep it up. As a former Staten Islander (b. 1960-1976), I’m glad to see that the level of discourse is far above where it was when I left. Actually, I think — judging from the map that Verve has (not always accurate) — it looks like you’re not far from the house where I spent the first four years of my life. City Boulevard, off of Forest Ave. Small world. Anyway, I welcome you to visit my own blog, boblandedits.blogspot.com, where I hold forth on various aspects of publishing — probably not always to the glee of my clients, but I try to keep anonymous the ones who make me mad.